Plating, Polishing & Lacquering, Lighting Fixtures, Repairing, Expert Silver & Sterling Restoration. Custom and service oriented, custom designed floral arrangements for the bride and wedding party. 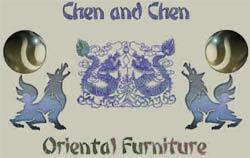 One of a kind Chinese furniture, accessories and artwork. 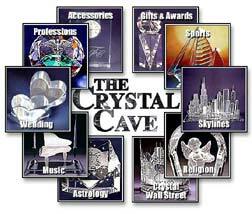 The Crystal Cave of Wilmette, just north of Chicago, offering crystal monogrammed and engraved wedding gifts, corporate awards, religious, seasonal, sports, music, professions and city skylines. The elegance of crystal... engraved or custom cut, direct from our workshop. Whatever your needs are, we cut and polish to perfection. Visit our showroom and view our engraved and custom designed crystal awards, corporate gifts, personalized wedding and anniversary gifts, engraved family trees, and monograms. In addition, we repair goblets, paperweights, crystal figurines, vases, bowls or your crystal heirlooms. Enjoy a wonderful experience in our crystal wonderland. Whether you need a single perfect gift designed and engraved by our master craftsmen, or a distinguished award that expresses your elegance as well as your individuality, the Crystal Cave staff will help you enhance the occasion. We also repair crystal, stemware, vases, bowls, and art glass. David Simm, F.S.W.P.P., A.M.P.A., runs a successful full service studio on Chicago's North Shore. During his thirty five years in the industry, the internationally acclaimed British Photographer, has mastered a variety of disciplines and traveled many countries, creating distinctive images for a number of household names. Best prices for wedding arrangements, over 25 years of experience. Fresh, love-inspired ideas to any wedding plan. Specializing in unique tropical arrangements. Custom floral arrangements for the bride and bridal party. Architectural artifacts, antique lighting, mantles, furnishing, remodeling and renovations. Weddings, funerals, special occasions and plants. Specializing in Jewish weddings, may varieties of hopha's, custom floral designs for all wedding needs. Specialists in fine antique English silver & old Sheffield plates. Specialize in custom framing and floral. Also offer cake decorating classes. Michaels stores are located in 48 states, Canada and Puerto Rico. The stores are large craft superstores offering a complete assortment of arts, crafts, framing, floral, decorative wall decor and seasonal merchandise. Michaels stores average 17,900 square feet of selling space and offer on average 40,000 items with annual average store volumes of $3.5 million. As our mission statement says, our goal is to help people express themselves creatively. We design our stores to inspire shoppers to develop new d�cor and project ideas and to find the materials they need to successfully complete their projects. We offer classes and demonstrations that teach basic and advanced skills and provide hands-on experience in a community environment. Specialize in custom framing, framed art, jerseys & custom framing. Photo restoration and wedding photography. Antiques & collectibles, pottery, glass, silver, linens, jewelry and furniture.